The Global Positioning System (GPS) is the only fully functional Global Navigation Satellite System (GNSS). Utilizing a constellation of at least 24 Medium Earth Orbit satellites that transmit precise microwave signals, the system enables a GPS receiver to determine its location, speed, direction, and time. GPS works in any weather conditions, anywhere in the world, 24 hours a day. GPS is now a publicly available service which can be used by anyone. GPS satellites circle the earth twice a day in a very precise orbit and transmit signal information to earth. GPS receivers take this information and use triangulation to calculate the user's exact location. Essentially, the GPS receiver compares the time a signal was transmitted by a satellite with the time it was received. The time difference tells the GPS receiver how far away the satellite is. Now, with distance measurements from a few more satellites, the receiver can determine the user's position and display it on the unit's electronic map. GPS can calculate the longitude and latitude of locations and transmit this information to a receiver which enables the person using GPS to correctly locate and travel to destinations. Nations across the world are benefiting from GPS Technology in achieving the goals of greater road safety. International departments of transportation are loading up their geospatial data layers and taking them on the road to map the locations of every pavement segment, traffic sign, and guardrail for which they are responsible. Mobile GPS technology is enabling government officials to take their geospatial information out of the office to the places where it can best be applied — state highways and city streets. The state of Washington has initiated a new program that involves mapping every roadside feature, natural or manmade, that a vehicle could strike in its 7,000-mile-long state highway corridor network. Once this immense database is completed, the Washington Department of Transport will use it to devise strategies for reducing different types of collisions. In Holland, one of the GPS systems uses mobile phone movement to detect the location of traffic jams. Navigation technology that delivers real-time information on traffic conditions is being rolled out in Australia. This technology, already available in Europe, Japan and the USA is rolled out in Melbourne, Sydney and Brisbane provided that the navigation device companies adopt the technology. The Japanese government has embarked on a road safety campaign using cutting-edge technology in concert with the GPS car navigation systems found in many vehicles. It plans to develop a system that automatically transmits expressway accident and traffic condition information to dashboard-mounted global positioning systems. A Dutch research firm has found that satellite navigation technology has a positive influence on road safety. The availability and accuracy of the Global Positioning System (GPS) offer increased efficiencies and safety for vehicles using highways, streets, and mass transit systems. GPS enables automatic vehicle location and in-vehicle navigation systems that are widely used throughout the world today. By combining GPS position technology with systems that can display geographic information or with systems that can automatically transmit data to display screens or computers, a new dimension in surface transportation is realized. Today GIS is used to monitor vehicle location, making possible effective strategies that can keep transit vehicles on schedule and inform passengers of precise arrival times. The use of a satellite navigation system improves driver behaviour in unknown areas, heightens alertness and reduces stress levels. An international study revealed that the use of a GPS device reduces the number of miles driven by 16 per cent and reduces travel time in an unknown area by 18 per cent. 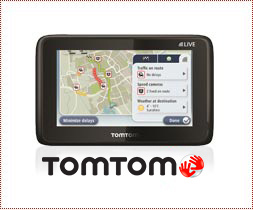 GPS systems assist motorists to in identifying the location of features on, near, or adjacent to the road networks. These include service stations, maintenance and emergency services and supplies, entry and exit ramps, damage to the road system, etc. Motorists are alerted through a constantly updated database of accident blackspots, primary school zones, safety camera locations and other hazardous stretches of road. New developments include research to provide warnings to drivers of potentially critical situations, such as traffic violations or crashes. GPS speed camera detectors help motorists drive within the local speed limits, ensuring safer and worry-free motoring. Before setting out, the motorists adds his destination address on the system's in-dash touchpad, and within seconds, arrows on the moving map and a kindly woman's voice guide you on your way. Most systems even enable you to specify the easiest, quickest or most scenic route. Motorists also receive information on the current speed, average speed, maximum speed reached an estimated time to reach the destination. The use of GPS (Global Positioning Systems) is the fastest and most accurate way of obtaining reliable data about accident locations. GPS is also the cheapest way to identify accident locations in countries with existing accident data collection programs. Localization has to be performed at the road accident location immediately after the accident occurred when the causes and circumstances can be examined more precisely. Mapping systems can be dangerous in the hands of the irresponsible user. More accidents are caused by drivers fiddling with map systems than drivers chatting on cell phones. Onboard systems usually open with a screen warning you to stop the vehicle before inputting addresses. Motorists should accept that satellite navigation systems are not infallible and that people should use them with due caution. The Spanish traffic authority is seriously studying a new law to fine drivers using their GPS navigation systems while their vehicle is in motion. According to a study done in Spain about half of the car accidents in Spain are caused by driver's distractions. Users in South Africa have been warned by security companies not to add their own home address on the GPS as this might allow hijackers to visit their places of residence. It might help to rather add a police station, school or hospital that is nearby. GPS is an essential element in the future of Intelligent Transportation Systems (ITS). ITS encompasses a broad range of communications-based information and electronics technologies. 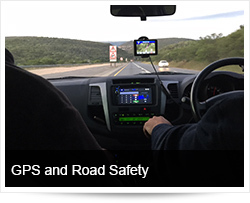 With the continuous modernization of GPS, we can expect even more effective systems for crash prevention, distress alerts and position notification, electronic mapping, and in-vehicle navigation with audible instructions. 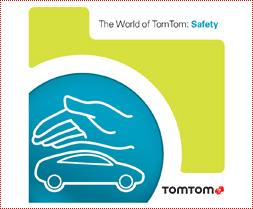 Click on the graphic to learn more about TomTom and Road Safety. Click on the graphic to learn more about how Independent research.